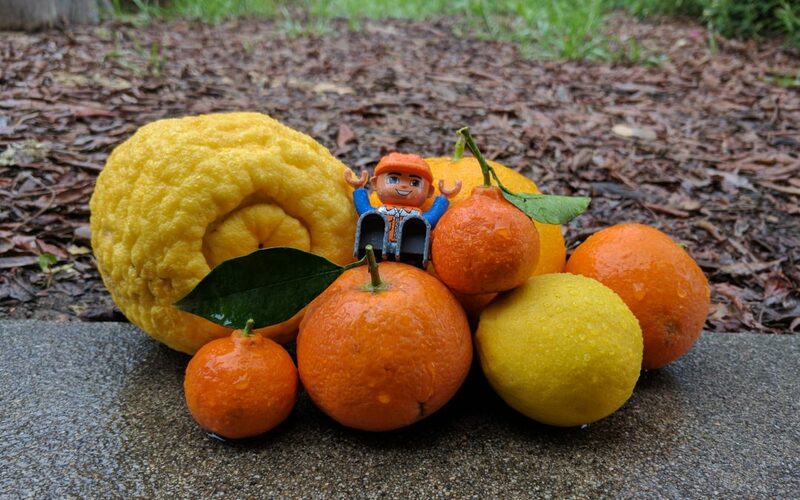 March is citrus month. Almost every kind of citrus tastes good in March in Southern California. While some are still ripe, others are already starting to taste sweet. What I mean is, some are wrapping up their seasons now, like navel oranges and blood oranges and Kishu mandarins, while others are in the early part of their seasons, like Valencia oranges and Gold Nugget mandarins. Here is what we should all do: Go to a farmers market and taste every different kind of local citrus available. Do any knock your socks off? If you can get the variety name from the farmer, then go and buy a tree of that variety from a local nursery. I did something similar a few years ago with a tour of the Citrus Variety Collection at U.C. Riverside, after which I planted a Cara Cara navel orange, Satsuma, Kishu, Gold Nugget, and Pixie mandarins. By the way, do you have children or grandchildren? You’ve got to give them the gift of a Kishu mandarin, which in my opinion is the best fruit tree for kids. About vegetables, March is a month of transition. We can still plant some vegetables that like to grow in cool weather (think lettuce), but we can also start planting some vegetables that like to grow in warm weather (think corn). To be specific about it, plant lettuce and its ilk as soon as possible, but be in no rush to plant corn and friends. I have found success sowing or planting those warm guys only toward the end of March. – Plant more citrus, of course!